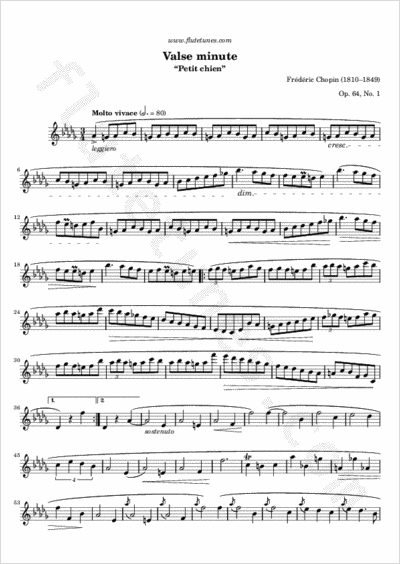 Published in 1847, the Trois Valses (“Three Waltzes”), Op. 64 were the last set of such works to be published during Chopin's lifetime, and were among the very last works sketched by his prodigious pen. Each of the three is among the shortest of his entries in the waltz form, making them entirely unsuitable for effective use in the ballroom. The “Minute Waltz” is the most famous of Chopin's waltzes, and ranks among the best-loved pieces in the entire classical repertoire. Its sprightly mood and kinetic energy belie the composer's personal situation at the time of composition: his health was in serious decline, and his relationship with novelist Aurore Dupin Dudevant (who wrote under the pseudonym of George Sand) was falling apart. The Minute Waltz is also known as the “Dog Waltz” (or “Petit chien”), because for some it suggests the image of a dog chasing its tail, and legend has it that the waltz was inspired by Chopin's own pet. The piece is used as the theme tune to the BBC radio show Just a Minute; despite its nickname, however, a typical performance of the piece lasts between one and a half and two and a half minutes. This is because Chopin's publisher, who coined the nickname, intended the “minute” to simply mean “small”.